But the question remains, what kind of water? NASA’s Curiosity Rover, which has been exploring the Red Planet since 2012, found new crystal-like geological structures the size of sesame seeds — which are likely additional evidence that, once, there was water here. The shapes, which NASA describes as “star-shaped and swallowtail-shaped tiny, dark bumps in fine-layered bright bedrock of a Martian ridge” recall gypsum crystals that are found in drying lakes on Earth, but of course, because Mars is not Earth, scientists are considering other explanations for these formations. The structures also raise other questions, such as when the features formed and whether the original mineral that was crystalized within them remains or was eventually dissolved. The results could tell us what was here before, whether it was a drying lake or flowing groundwater. These sesame-sized formations were discovered on an area of the Vera Rubin Ridge called “Jura”, on the northern slope of Mount Sharp. The Curiosity Rover has been exploring the Vera Rubin Ridge for the past five months. They were intrigued by the visible change in color of Jura, which looks pale and grey, compared to the red of the rest of the ridge. Could these sesame seed formations on Mars be evidence of water? “We were looking at the color change from one area to another. We were lucky to see the crystals. They’re so tiny, you don’t see them until you’re right on them,” says Abigail Fraeman of NASA’s Jet Propulsion Laboratory (JPL) and a member of the Curiosity Rover’s science team. Images from the Rover are almost immediately posted online, and these fossil-like formations immediately drew attention. 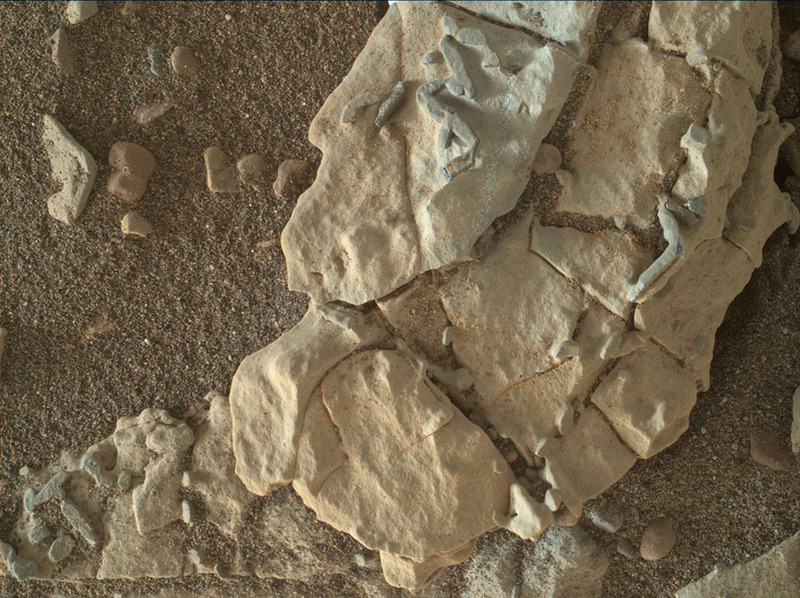 Project Scientist Ashwin Vasavada of JPL was interested, however, in the formations not for their fossil-like appearance, but because of the implications that the structures have for the region’s geological history. This could represent the difference between a regularly replenished freshwater lake in the mountains, for example, or a salty desert lake where water quickly evaporates. The Mars Rover has also found evidence of iron deposits in various features in the bedrock, which might be evidence of microbial life.